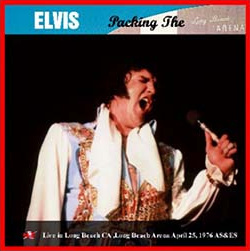 The MxF label released its third special product called “Packing the Arena'' featuring both the shows performed from Elvis in Long Beach CA, Long Beach Arena on April 25, 1976. The 2.30 PM show is previously unreleased, while the 8.30 PM show has been previously released on CD ("California Wave” on Memory Records in 2009). However here is presented in very improved audio-quality so, We believe it is the right time for a proper re-release. After the successful Las Vegas Hilton comeback in December 1975, in spite a little bit overweight but with strong spirit, Elvis is ready to face his long tour activities of 1976 ….... The first tour started in the middle of March , a passable tour but nothing more..the man obviously is afflicted from a lot of problems …personal relationship, recording session and overall self-attitude destructive to life …. everything seems to go wrong . This second tour confirmed the impression from the March concerts: Elvis was not looking after himself physically and artistically he was at a dead end. In spite the lack of renewal, in the repertoire are still included some strong numbers to make the concerts of a very good quality. In some of the more demanding artistically songs, Elvis builds his show, He is still able to find LIFE singing songs like You Gave a Mountain, America the Beautiful, How Great Thou art and last single Hurt. Without doubt this is the focus of the show and the audience appreciated that, making the concert atmosphere still incredible experience…. 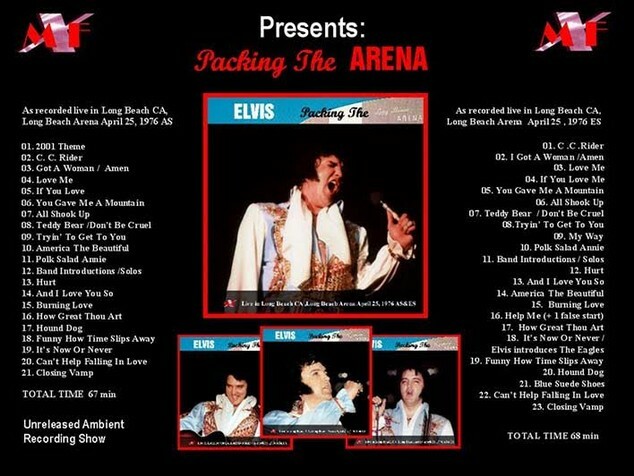 Talking about the concerts, both are solid with a few little variation of tracking list..in the evening one, Elvis performs three more songs : The life Anthem ; My Way, the religious ; Help Me and the fifty Rocker ; Blue Suede Shoes. Beside the focus of the show He still able to delivery in decent way, some of his classic rockers, Like Polk Salad Annie, Trying to Get To You and surprisingly in both the shows his best rocker in the seventies; Burning Love. The sound is very good for an ambient recordings, considering that this kind of recording is coming from a big hall no the intimate Las Vegas showroom… We have on our hands the original mono tapes of extremely good quality enabling us to carry out a simple re-mastering work, concentrating on the reduction of noise trying to achieve a more clear sound balancing the channel and put at the right speed the tape. The result a pretty dynamic tapes with a great definition of the background music and for sure you can live the atmosphere of a Elvis’ concert in the seventy.